Massachusetts State Police Troop A Major Pat Russolillo recently received a letter from a 71-year-old Weymouth man -- a Marine Corps Vietnam-era veteran -- who will never forget his interaction with Trooper Steven Hanafin of the Andover Barracks. The story started when, one night a little over a month ago, the man, after coming out of New Hampshire, was driving south on Route 93 when he had to pull over with a tire problem, the State Police reports on Facebook. "I was scared and had not much cell service left on my phone," the man wrote. "I called my road service and was having hard times with them. Then God sent an Angel, Tpr. Steven Hanafin, to my rescue... He protected me and after a while he even talked to my road service company and told them I was in a bad area and he hoped they could come soon. "I told him I would be OK if he had to leave, but no, he said he was not leaving me alone until I got on my way. Then, while there, the Trooper saw my plate and thanked me for my service, and said 'Semper Fi.' Then I found out he was in the U.S. Marine Corps also. So there you are: God sent me an Angel, and a former Marine. Amazing. God works in mysterious ways. "Now, after the road service came, Tpr. Steve took my tire and he put it in my trunk for me. I closed up the trunk and then, can you believe it, I went to start my car and the battery was dead from having the flashers on." Trooper Hanafin was not done helping the motorist. The Trooper made a phone call, and within five minutes two men showed up and jumped the battery. At last the man was able to continue his ride home. "Now, after I got going he followed me until I got on the road home," the man continued in his letter. "And... he took my number and called me at my house to make sure I got home safe. Never in my life have I seen this and when I tell somebody they can't believe what I tell them, even my brother who for 28 years (was) a police officer." 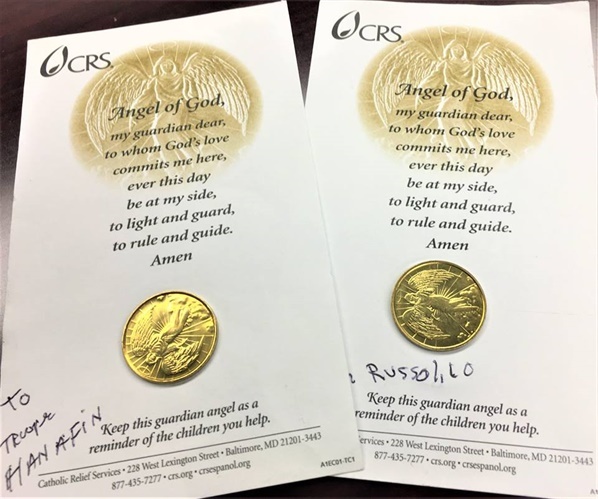 Along with the letter, symbolic of how he felt about Trooper Hanafin, the man sent two Guardian Angel coins, one for the Trooper and one for the Troop Major.